They are comparing crystals found in nature with a processed chemical here. But if CaF2 (the ore fluorite) was meant be used for water treatment it would have to be processed to remove impurities (the natural ore is far from pure). The most effective way of removing contaminants is conversion to hydrofluoric acid and precipitation of calcium fluoride (CaF2). Ending up with a “man-made” product! 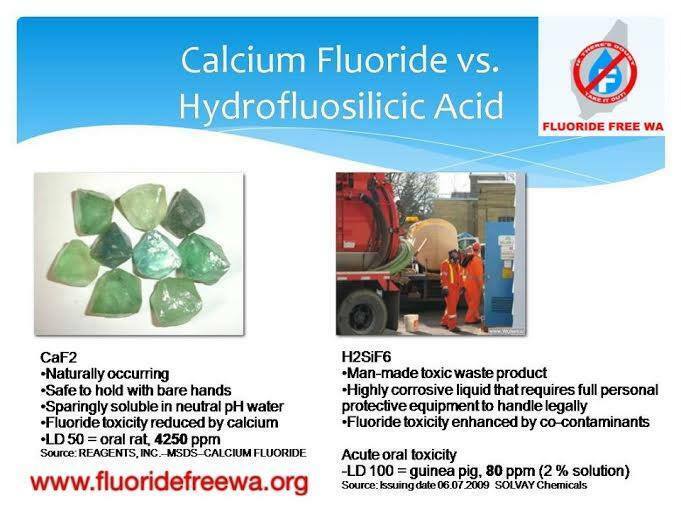 Some anti-fluoride campaigners seem to argue that fluoridation would be OK if the fluoridating agent used was CaF2. The contaminants present and need for purification are only two of the flaws in their argument. The low solubility of CaF2 is another flaw. Incidentally, fluorosilicic acid is effectively purified in its manufacture because of the differing melting and boiling points of heavy metal fluorides and silicon tetrafluoride. True, concentrated fluorosilicic acid is much more corrosive than CaF2. But so what – this is an issue for those manufacturing, transporting and handling the source material. It is not an issue for consumers as drinking water does not contain either CaF2 or fluorosilicic acid. So the advice to those manufacturing, handling and transporting CaF2 is that it is not safe to hold with bare hands! This is one of the disadvantages of CaF2 as a fluoridating agent as a saturated solution has a fluoride concentration of about 7.5 ppm. Just imagine the size of the container required to hold the quantities of CaF2 solution required for addition to a reservoir! The high concentration of fluoride in liquid fluorosilicic acid (and the fact that it rapidly decomposes to produce the hydrated fluoride anion on dilution with water) provides a big advantage to it as a fluoridating agent. Yes, high concentrations of fluoride are toxic – although the concentration in community fluoridated water (CWF) (0.7 ppm) is quite safe. The toxicity of ingested fluoride at high concentrations can be reduced by the presence of calcium – because of the low solubility of CaF2. But let’s be realistic, in the absence of other factors the addition of the appropriate amount of calcium would reduce the fluoride concentration to about 8 ppm. Far higher than the regulated maximum for CWF. As for some other speculated protective action the calcium in CaF2 could provide – the calcium concentration in a saturated CaF2 solution is only about 7.5 ppm – and at the fluoride concentration used for fluoridated water CaF2 would support a calcium concentration of about 0.8 ppm. Any calcium from added calcium fluoride would be irrelevant compared with the natural calcium concentrations in drinking water. The graph compares these figures for several treatment stations in New Zealand – see Calcium fluoride and the “soft” water anti-fluoridation myth for further information. By definition, then, the fluorosilicic acid used in CWF is not a waste product. It would be if it were disposed of without use – then so is food. Anti-fluoride campaigners also seem to think that a by-product is somehow evil. This is because most fluorosilicic acid is produced as a by-product of phosphate ore processing. But, come on. Surely production and use of by-products is a desirable feature in judging the conservation aspects of a manufacturing process. And would phosphate chemicals be somehow evil if they were produced as a by-product of fluoride chemical manufacturer from phosphate ores? I discussed the problem of contaminants in “natural” CaF2 above and added that contaminants in the fluorosilicic acid used for CWF are very low. But don’t take my word for it. Water treatment chemicals are regulated and the fluorosilicic acid used for CWF must pass rigid tests for the presence of contaminants. The regulations provide for maximum concentrations of contaminants and where a certificate of analysis shows these are exceeded the material is rejected by water treatment plants. I discussed this in my article Fluoridation – are we dumping toxic metals into our water supplies? where I debunked this claim made by Fluoride Free NZ. I also provided some data on the chemical analysis of fluorosilicic acid samples. In the article Fluoridation: emotionally misrepresenting contamination I compare the real concentration of contaminants recorded in certificates of analysis with the regulated limits. It turns out that the fluorosilicic acid manufactured in Australia and New Zealand is very low in such contaminants – see figure below. I showed this in the article Fluoridation: putting chemical contamination in context where I compared the amount of arsenic from different sources in the Hamilton City water supply. The figure below from that article shows that natural levels of arsenic in the water source (the Waikato River) are much higher than the recommended levels for drinking water. Even after treatment (which reduces the arsenic levels to below the recommended maximum) the contribution of arsenic from this natural source is still much greater than the calculated contribution from the fluoridating agent used. This bit of anti-fluoride propaganda is just another example of scaremongering relying on chemophobia and lack of information, even ignorance. This entry was posted in Health and Medicine, SciBlogs, science, Science and Society and tagged calcium fluoride, chemophobia, fluoridation, fluoride, fluorosilicic acid, Propaganda, scaremongering, SciBlogs. Bookmark the permalink. fluoride is not an allergen, and therefore it can not cause an allergic reaction. “Self-diagnosis is prone to error and may be potentially dangerous if inappropriate decisions are made on the basis of a misdiagnosis. Because of the risks, self-diagnosis is officially discouraged by governments, physicians, and patient care organizations”.